Oops! I almost forgot to take a "Before" pic of this wooden 26" spoon and fork my mom salvaged for me from the garbage when one of her fellow tenants moved out of the apartment building. As you can see, I am painting the spoon and fork white. To be exact, I am painting the wooden spoon and fork with Fusion Paint (Champlain) . These boards are 31" long, cut from cedar dog eared fence panels 5/8"x 6" x 6' from our local Menard's. I stained the boards with homemade vinegar and steel wool stain. 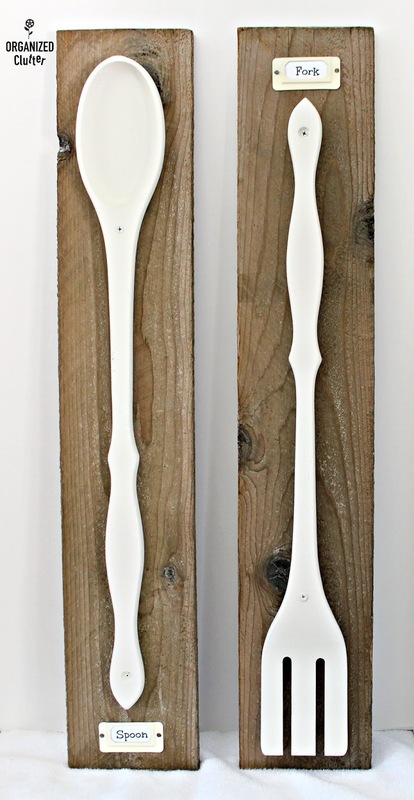 So my 26" spoon and fork are positioned on the two lengths of fence boards cut 31" long. I am going to add metal label frame holders from Hobby Lobby. I spray painted them with Krylon K04108000 Chalky Finish Spray Paint, Colonial Ivory, 12 Ounce . 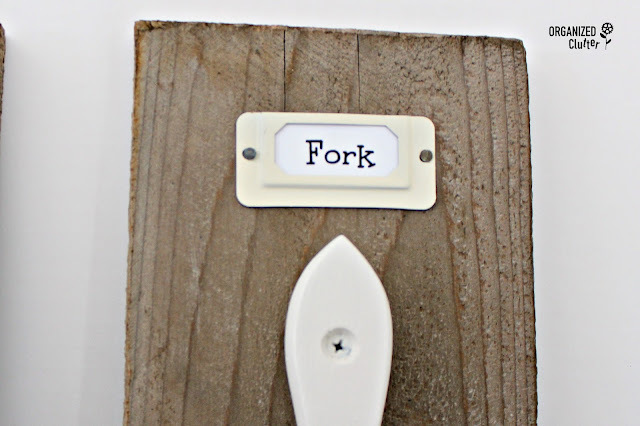 I printed off "Spoon" and "Fork" on white card stock on Picmonkey in a 96 sized text font. The spoon and fork had hanging holes on each end so displaying them on my rough sawn lumber worked well. Here is the "fork" label above the fork. And the "Spoon" below the spoon. 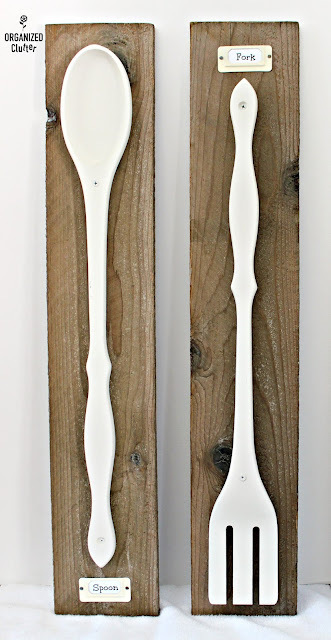 I added saw tooth holders to the back and screwed the spoon and fork to my boards. I love them but I don't have any room for them. Will check with my daughters first before I sell them! I like seeing things redone. You are creative! 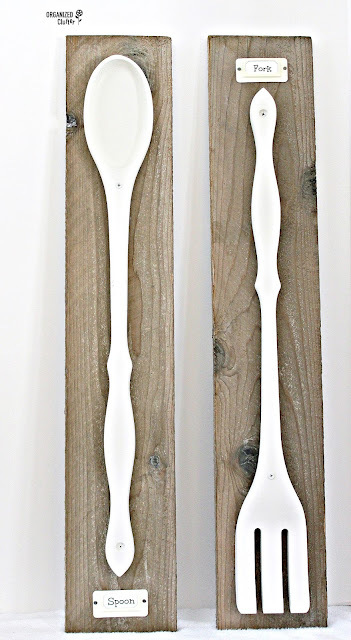 I love those big old spoons and forks, I can't believe someone would just throw them out! They turned out great! Yes I love your repurposes too. 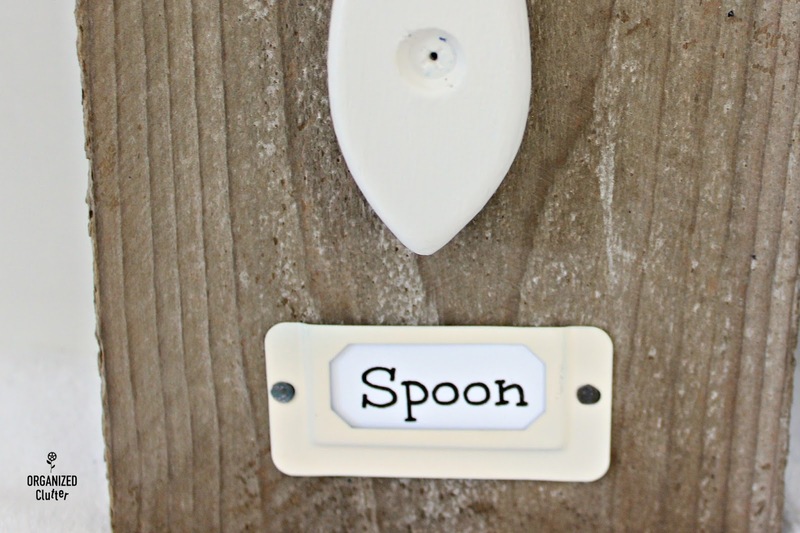 The spoon & fork are nice & I can't believe someone was throwing them out, but you get tired of it, I guess.